This article reviews how to schedule employees from both the web dashboard and the mobile app. The Shift Schedules page in your ClockShark dashboard allows you to schedule employees for a specific Job at the designated time and date. To schedule an employee, you can either drag and drop a Job from the left side of your screen, or you can click on the calendar itself and select Add Job. 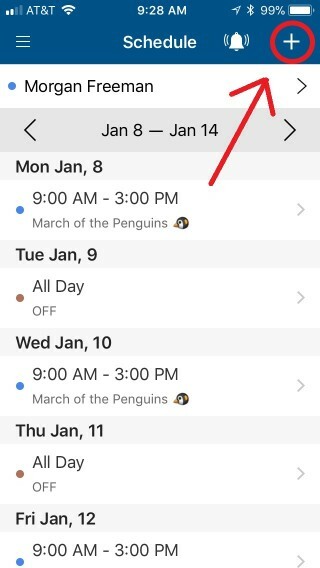 Once you've scheduled an employee, they'll be able to see the schedule immediately in their mobile app. 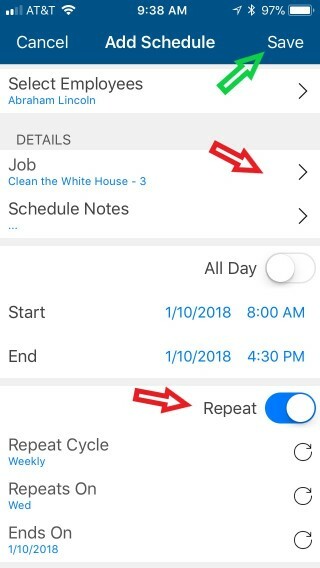 In the mobile app, the employee just needs to visit the schedule tab and tap the refresh button to make sure they are seeing the most recent schedule. Refreshing the schedule will not always be needed, since the schedule will be updated periodically when the app syncs, although getting employees in the habit of using the refresh button will ensure they are always looking at the latest schedule. To make changes to an existing shift, such as scheduling a different employee or changing the times scheduled, you can simply drag and drop the shift onto a different employee, or click on the shift to edit it. Scheduling employees from the mobile app follows the same process as scheduling employees from the web dashboard, just on a different (and smaller) screen. Let's begin. 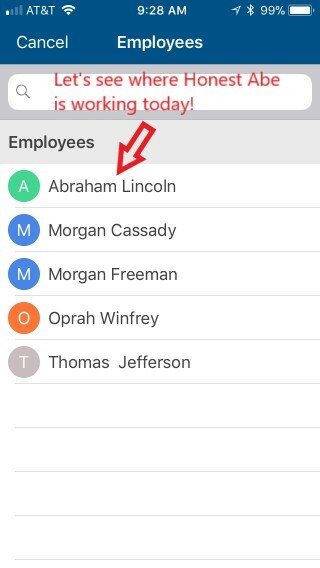 To schedule an employee, first open the app and navigate to the Menu > Schedule screen where a "+" icon will be visible in the top right of the screen. Clicking the "+" button will present a new screen where you can select the persons you would like to schedule. Just like the website, you can save time by scheduling multiple employees at one time. After selecting the employees, on the next screen, you will select the scheduled job, the shift time, and even add specific notes to the scheduled shift. If the job being scheduled repeats regularly for the same employee, you can even choose to repeat that same shift up until a specified future date. When finished, click "Save" in the top right of the screen. To notify employees that their schedule has been updated, click the Bell icon in the top right of the schedule screen. 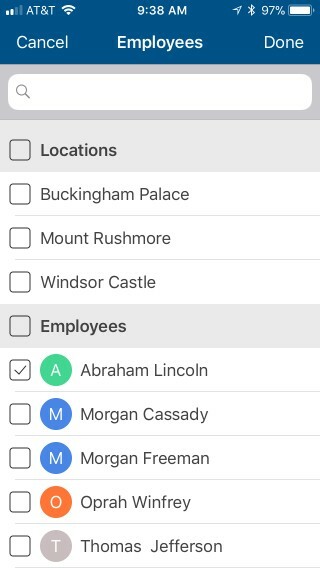 You can choose to notify employees depending on how recently their schedule has been updated. 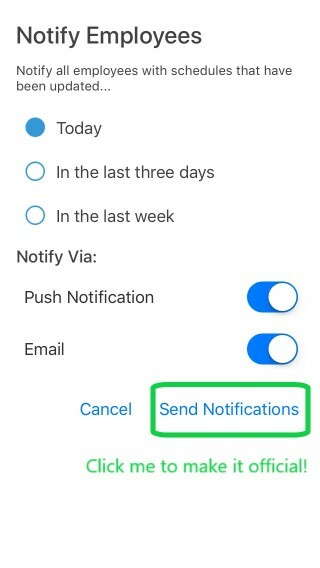 Just like on the Web dashboard, you may choose to notify employees by email, Push notifications, or both. 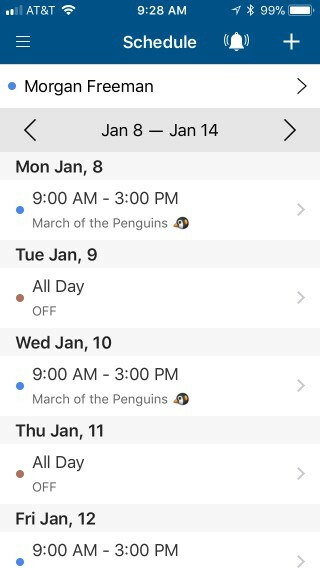 Not only can you schedule and notify employees from the mobile app, but you can also view their upcoming schedules. Remember that administrators have permission to view everyone's schedule. Employees, such as supervisors or office managers, who need to view the schedule of other employees can be given Manager Permissions to view them. To view other employees' schedules from the ClockShark app, navigate first to the Menu > Schedule, and press the name field in the screen. 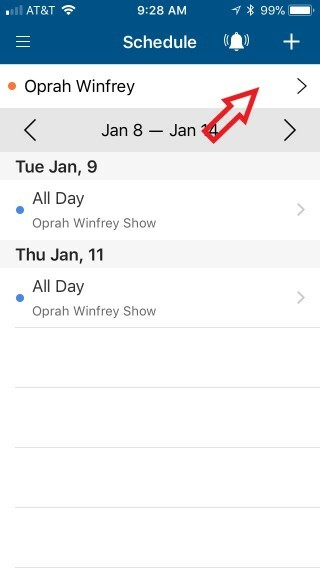 Note that the name (and schedule) of whoever has logged into the app will appear first. To change the schedule, press the "Name" field. Choose from the list of other employees the once you'd like to view. Remember that Administrators will see all active employees in this screen, but employees who have Manager Permissions to view only a subset of employees may see a smaller list here.